An exceptional round for any owner of a .357 Sig firearm, this is a 1000 round case lot for purchase with an exceptional value for money. 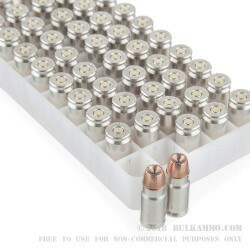 Given the extreme performance of the .357 Sig and the premium improvement over mainstream personal protection rounds that this load has, it is an easy choice for those that want the best of the best. Start with the proven Gold Dot projectile by Speer, the new improved mechanical bonding virtually eliminates grain weight loss and jacket separation issues in the most extreme situations, as well as offering superior uniformity in expansion. 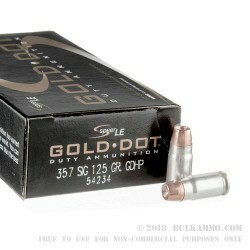 It is this uniformity in expansion that has made the Gold Dot such a well-known bullet. 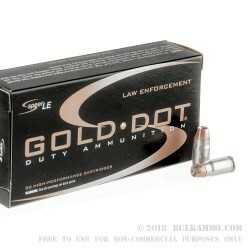 This known performance combined with the other components on the load and the improvement on the mechanical bonding process which ushers in a slightly different nose design for the Gold Dot projectile, makes it a great choice for those unsure of their next go-to ammo. This is a premium choice with a great price point. The 1350 feet per second velocity and the 506 pound feet of energy delivery at the muzzle means this is not your ordinary range round. 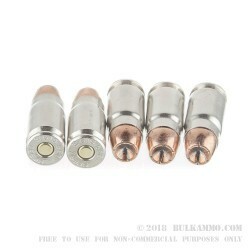 Combined with the excellent bullet design and the nickel-plated brass with Boxer primer, this is a top choice for the personal defense shooter with a .357 Sig.